Actually Sarah Kay was only the pseudonym of Sydney based illustrator Vivien Kuboš. The touching Sarah Kay images were actually conceived out of a mother’s loving appreciation of her own children. She captured the special moments she had observed at home in evocative drawings of her children’s wonder and curiosity. But because of a rather shy and private demeanor, her talent was usually reserved for her family and close friends. After much encouragement from people who appreciated her talents, Vivien was finally persuaded to show her unique designs to an Australian greeting card manufacturer who immediately recognized her skillful perception of emotion and mood. The Sarah Kay greeting card line became immensely popular in Australia. Her beautiful portrayals soon appeared internationally, and Sarah Kay became beloved by a thoroughly delighted European public. Among her admirers in Europe were the designers at ANRI. Who envisioned her work transformed into an enchanting series of ANRI figurines. Realizing that her drawings would translate exquisitely into three-dimensional form, ANRI initiated a creative partnership with Sarah Kay aka Vivien Kuboš. By 1983, interpreting Sarah Kay motifs had become the work of ANRI Master Sculptor Ulrich Bernardi, who was already well known for his original nativity figurines and other religious pieces. Using the finest Cembra pine anywhere, he began transforming Sarah’s designs into three dimensional wooden sculptures. 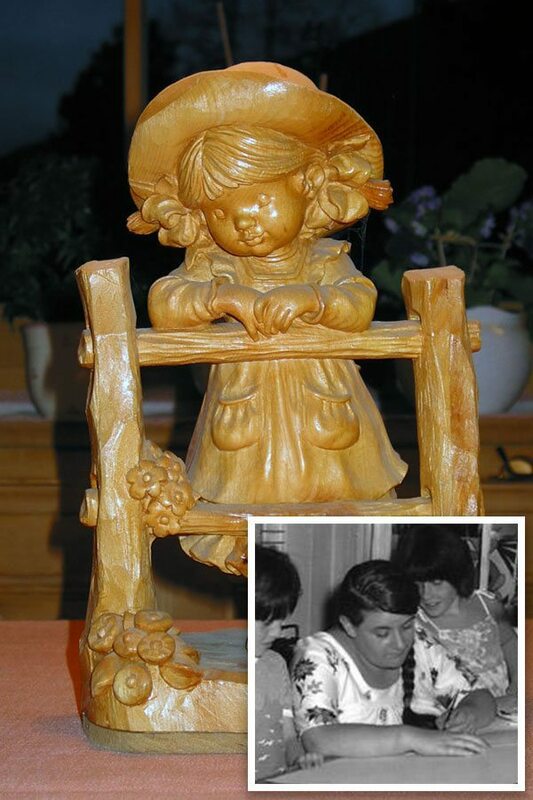 Vivien’s love for art and her own children blends with Ulrich Bernardi’s passion for woodcarvings, to bring you these very special and precious figurines. These hand carved, hand painted little works of art represent the simplicity and unspoiled happiness of children at work and play. Collectors everywhere continue to celebrate this loving tribute to children.